Heddon’s 1952 catalogue introduced to the fishing world a new 3” long, 3/8 oz. floating - diving lure which was to remain in production for around 50 years. Well beyond the time when Heddon became part of the Ebsco / Pradco group in 1984, this lure was still to be in demand by anglers from all over the world. Supplied initially in a Heddon Banner box, it was a revolutionary new shape that needed no metal vane or blade to impart action to it. 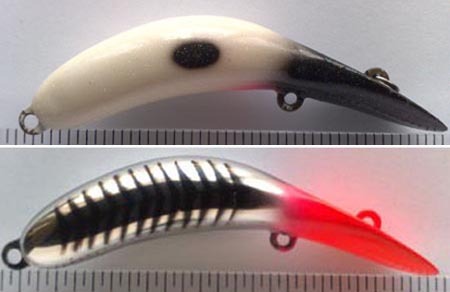 The line tie was located on the angled oval face or bill, which provided the surface area for the water to act against on retrieve, which would then cause the lure to dive. With the smooth, almost sensuous shape of the body behind a slim neck, the lure had a fast, vibrating, rolling lateral action which would progressively increase with faster line recovery. What was the name of this new lure? THE TADPOLLY SPOOK, Heddon series #9000. With the body shape developed from the original Heddon series 5000 and 6000 wooden Tad Pollys which were produced from the 1920's until the early 1940's, the lure was made from Heddon’s 'Spook' plastic, so named because of it’s almost ethereal transparency. 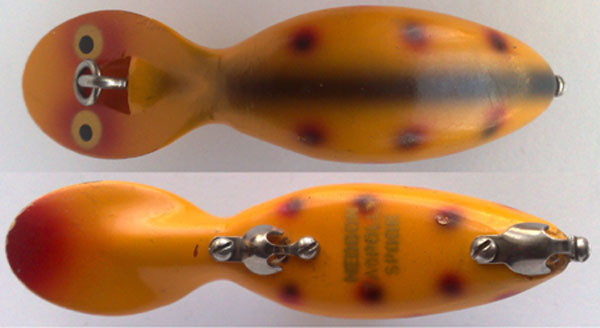 This material was used for several different Heddon plastic lures, such as the River Runts and Vamp, and all had 'Spook' added to their model name to differentiate from the wooden bodied models. Whether the painted ribs on the Shore Minnow finishes helped name this material, or came after is uncertain. Fitted with the same surface hardware as other Heddon lures of the era, the 1952 Heddon catalogue introduced the lure in 12 different colors: Black and White Shore Minnow (XBW), Bullfrog (BF), Golden Shiner (PG), Light Green Scale (LD), Yellow Perch Scale (L), White, Red Head (RH), Red Head Flitter (RHF), Silver Body, Red and Black spots (SRB), Silver Shore Minnow (XRS), Spotted Orange (SO), Yellow Body Red Head (YRH), and Yellow Shore Minnow (XRY). All of these had gold painted eyes with black pupils and red tip on the underside of the bill with the exception of the Black and White Shore Minnow which did not have the red tip. Since the initial writing of this article, I have been advised on good authority that the range of available colors with gold eyes, beyond the catalog colors, includes Tadpollys in Fish Flash colors, Green Shad and even one with the Westinghouse logo, an 'advertising' logo which has been seen on other Heddon lures. These three I have never come across so irrespective of being low volume issues or not, they are pretty hard to add to any collection. At some point between introduction and 1962 Heddon added to the colour options a finish from the earlier 5000 and 6000 Tad Polly ranges. This paint finish on the Gold Eye Tadpolly was, as far as I am aware, only available in a very dark almost Black shade of Green, which was applied over a contrasting off white or cream base coat. On drying the top coat would randomly craze as it shrank giving us the name of "Crackleback" (GCB). I Am still hopeful of one day adding one to my collection. 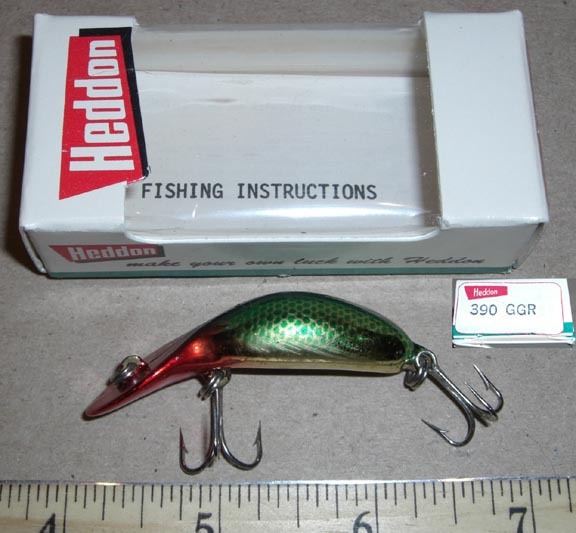 There was even a plastic lure called the "Crackleback", Heddon series 8000 and 8050 launched in later years which was only available in this finish in various colours. In 1960, the catalogued size of the Tadpolly Spook changed from the original 3" to 2-7/8". This 'new' slightly different shaped Tadpolly Spook had a head or bill which was shorter by 3/16” and narrower by 1/8”. This model is commonly referred to as the Narrow Face Tadpolly by collectors. Surface hardware was still used for the forward hook but the rear or tail hook was attached using a eye screw with a metal surface cup or bell on the screw thread. Commonly known as Surface Cup Hardware, why we see this change is open to debate, because the body moulding still had the indents to take the rear Surface Hardware fitting but without the forward screw hole being drilled. (Note: One somewhat different feature of the Tadpolly Spook was that, unlike other Heddon plastic lures, the body was molded at the tail to 'fit' the winged edges of the tail hardware). Along with the change of shape came a change of colour choice. The 1960 Heddon catalog listed only 6 available colors, Perch (L), Spotted Orange (SO), White, Red Head (RH), Black (B), Coach Dog (CD) and Yellow Coach Dog (YCD). I would like to say, gone were, but I’ll say I have not seen the Narrow Face Tadpolly Spook in Black Crackleback, Brown Scale, Golden Shiner, Light Green, Silver with Red and Black spots, Silver Shore Minnow, White Shore Minnow, Yellow with Black spots or Yellow Red Head finishes, though I live in hope that if I ever come across any of these I will be in a position to buy them! However, we do see in this model the introduction of several new colours with Gold eyes and starting in 1962, Cream eyes, both with Black pupils. Newer colours that I have seen are Black (B), Red Coachdog (RCD), Silver Scale (? ), a different Spotted Orange (SO), White Coachdog (WCD), and Yellow Coachdog (YCD), which, along with some of the originals gives us a total of at least 13 options plus the eye variants. On the White and Yellow Coachdog finishes, the Cream eye versions have a black blush around the eyes, and on both the Red and White Coachdog finishes, along with what I call the Silver Scale, the belly is painted in a pearlescent finish. 13 seems a strange number of paint schemes, so one never knows what might turn up. 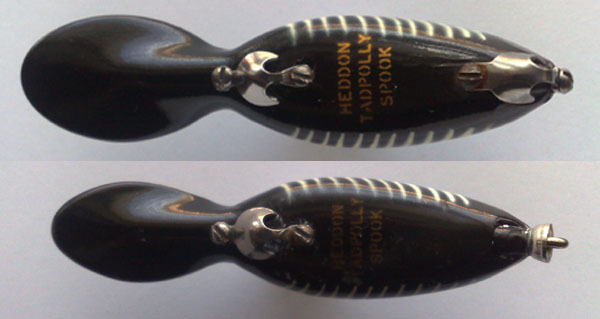 By 1962 Heddon had reverted back to the earlier shape Tadpolly Spook, possibly because the Narrow Face model was not as popular with anglers for some reason. In 1968 the Tadpolly Spook disappeared from Heddon’s annual catalogue but reappeared in the 1969 edition. This coincided with a change in ownership of the company, and when the reissue occurred, the Tadpolly had undergone another minor design alteration. The body used a different mould which was cruder in shape, with hard edges particularly on the shoulders, and a noticeable neck seam. Cruder they may have been, but not as crude as some cheap copies, with different diameter eye screws, that surface for sale occasionally. Side by side and with both in hand, the poor quality copies are easy to spot, plus they are noticeably lighter in weight. Another change, perhaps to reduce production costs, was the change from Surface Hardware to eye screws for both hooks. It was around this transitional time we began to see the loss of the word Spook on both packaging and belly stencils. 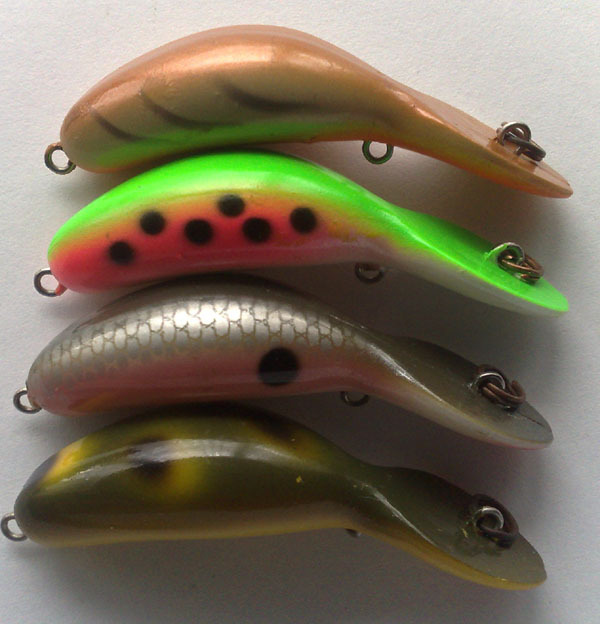 Some lures were made using the clear Spook plastic in the newest moulds and these kept the name Spook, while others were made using a new non transparent plastic in the same moulds and the lure just became the Tadpolly. 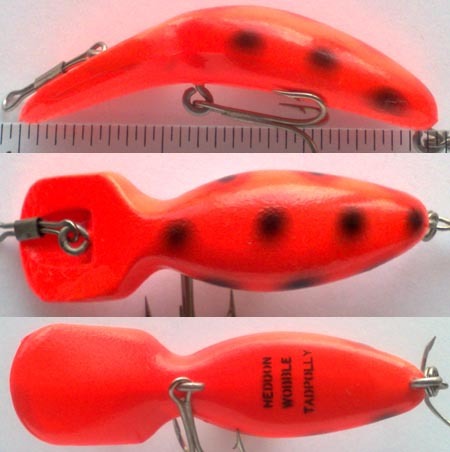 And just to confuse the matter more, there is a crossover where a clear Spook plastic lure may only have Heddon Tadpolly stencilled on it. 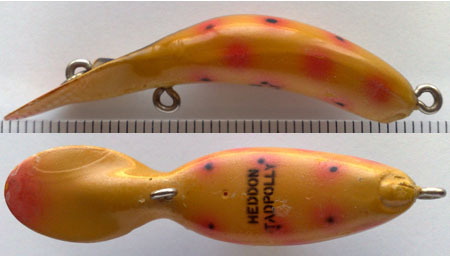 This third generation of “Tads” was not available in many colour options, but at the time, the same could be said for nearly all of Heddon’s lure range. By 1972 a smoother body mould was back in use, the standard size Tadpolly was now rated as 1/2 oz. class, and all sizes of Tadpolly, along with several other Heddon models, had adopted the brass plate hook hangers that would stay until the end of production. 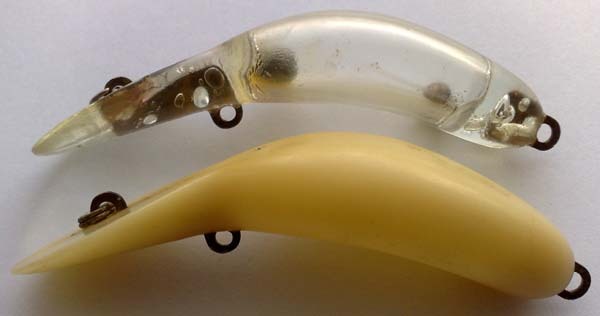 It is believed in some quarters that this change was engineered to pacify anglers who were complaining of losing hard fighting fish when the screw eye carrying the hook was pulled out of the body of the lure. True or false we don't know but with Tadpollys being aimed at Salmon anglers, it seems quite conceivable. 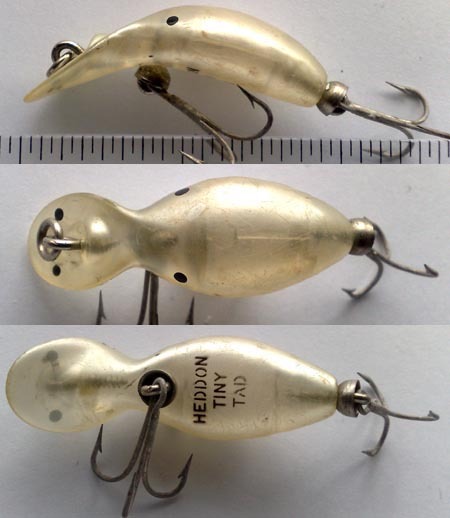 In the early 1970’s Heddon started producing Tadpollys with a chrome or nickel plate type finish. This brought forth a range of lures with coloured paint accents or details overlaid on the bright metallic finish. The years of 1977 and 1978, when Heddon had found a way to colour the lures without paint, saw the number of colour options flourish. After the further introduction of fluorescent or Day Glo paint finishes, and also a luminous paint which when charged with light, would then glow in the dark in a green hue, the permutations seemed endless. In fact I have recently heard of a collector who has over 320 different 3” Tadpollys. The luminous Glo Tads as they were called, were available in Blue (DBL), Green (DG), Brown / Khaki (KA), Red / Pink (DPK) and Yellow (DY), with just the back of the lure coloured. Series numbers had the last digit increased by 1 so a 9000 Tadpolly in Glo would be 9001. 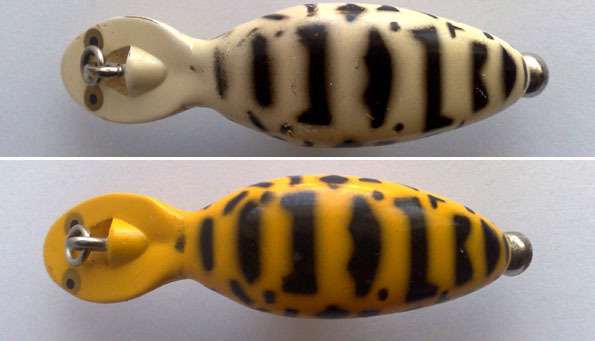 Later models had both the back and bill of the lure coloured, along with a silver scale pattern added to the flanks. To complement the five basic Glo Tads, Heddon produced other glow in the dark finishes such as the Glo Rib Alewife, a luminous body with fluorescent red ribs and another for which I have the colour code, VGR, but no name. This beauty again has a luminous body but with fluorescent orange spots, presumably using the same spray masks as other spotted lures. 1983 was the last production year for the Glo Tads. A point has to be made that the coloured paint used does not last as well on the luminous coating, meaning many early Glo Tads are seen, even in unopened boxes, where the colour has faded to such an extent that without the box and code, it is almost impossible to tell the original colour. Also in 1983, Heddon produced a promotional colour scheme for Pepsi Cola. These lures were available in a complete fishing package with rod, reel and line or just singly. Today, Pepsi Tads command some of the highest prices and yet they are nowhere near as rare to find as that which some consider the prettiest Tadpolly finish of all, the Bluegill (BGL). Despite the number of various colours and combinations used over the years by Heddon, when the company was sold to Ebsco in 1983/4, there were only 15 options in available. Ebsco / Pradco continued to use the latest and last Heddon moulds to produce Tadpollys into the early part of the 21st century. Many of the colours used were new and unique, and like Heddon, a new code or colour would be created by the simple addition or subtraction of an element or two. A prime example of this is the White body Blackhead (WBH) finish, which, with the addition of an oval spot on the flanks, a pink throat blush and a subdued glitter coat, becomes Panda (64). Similarly, the Nickel Plated Red Head (NPRH) can be found with a solid paint Red Head, or with a coloured lacquer type Red Head, add black ribs and spine and you have Nickel Red Head Black (NRHB). Through the years 1975 to 1987 a version of the Tadpolly was available that had a loose ball bearing in the body. This rattled backwards and forwards and from side to side as the lure worked, making what was, and is, believed to be a fish attracting sound. This particular variant was to be called the Clattertad Tadpolly and was available in a lot of the same colours as the Tadpolly. The same principle was applied to both the Magnum Tadpolly and Tiny Tad, of which more in a while. 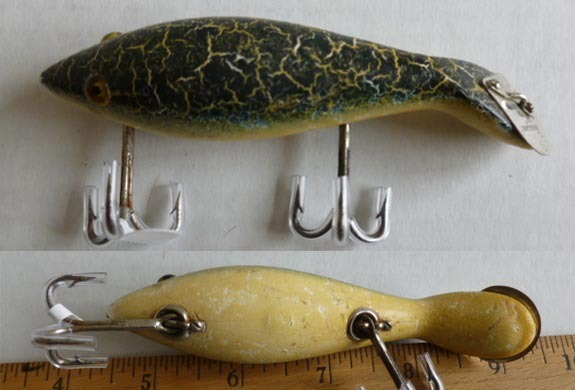 Other manufacturers also produced rattling lures, indeed even to this day, so perhaps there is something in it. Either that or we are still just as gullible to clever marketing nearly 40 years later. 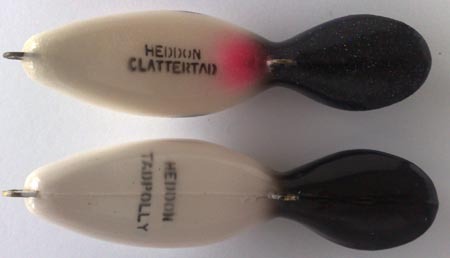 Towards the end of the Heddon years, in fact 1982 to 1984, two variants on the Tadpolly body were manufactured. 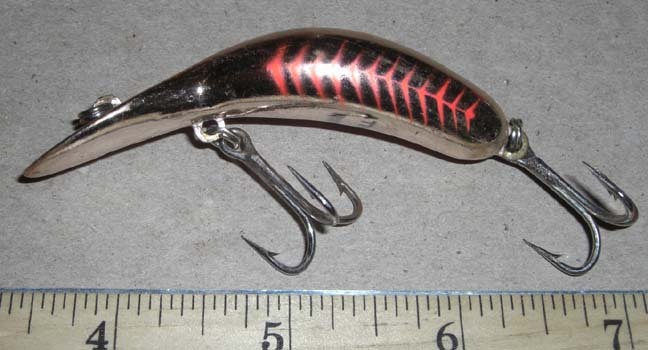 One had the addition of a clear, bright red plastic tail between the rear hook and the body, presumably borrowed from the Firetail Sonic lure. This gave us the Jointed Tadpolly (9015), which was available in only a very restricted number of colours. The second body variant was the Wobble Tadpolly (9025). Again only released in a limited number of colours, this had a squarer shape to a much thicker head or bill, intended to increase the action of the lure. The fact that both variants had such a short lifespan is perhaps testament to the improvements not being so. Personally I find the Wobble Tad just pig ugly! 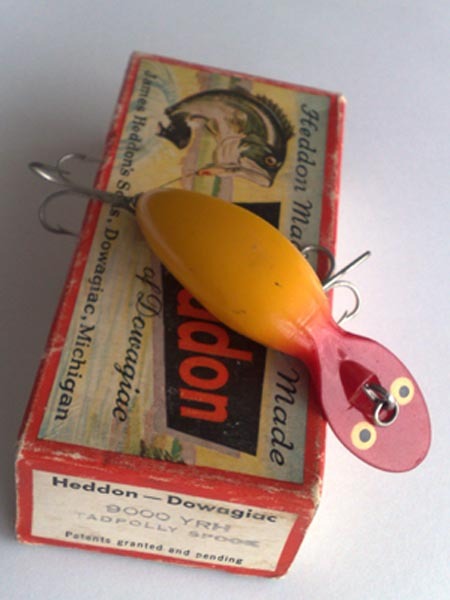 Back in 1953, a successful year after the launch of the Tadpolly Spook, Heddon brought out a smaller version. Measuring just 1 7/8“ and weighing only 3/16 oz., the Tiny Tad (390) was aimed at the spinning rod / reel market which was by then beginning to burgeon. Early models, packaged in a Red Window box, had Surface Cup Rig hook hangers which were slightly inset into the body, but later completely on the surface. Finish wise they were available in most of the colours of their larger brethren, complete with Gold eyes with black pupils. By 1972 the body shape had changed a little to become at 2 1/8” a little longer, a little heavier at 1/4 oz. and had a shallower curved profile, more like the 3” Tadpolly. It had also been updated with the brass plate hook hangers previously mentioned. Tiny Tad in pearlescent colour with Shad Spots - 390?? I have one early Tiny Tad in a finish that I’ve not seen elsewhere. It is an opaque pearlescent colour with Shad spots on it’s shoulders and the same size black spots for eyes. Because the plastic body is clear, one can see the thread of the eye screws inside. In my experience, and I don’t profess to be an expert, it would appear that the Tiny Tad was also produced with some other unique finishes. Examples such as the metallic Gold Black Scale (GBS?) pattern, or paint finishes such as a Navy Blue with Yellow Spots and Spine, a Burnt Orange body with Black spots or even, a Navy Blue body with Yellow spots and spine, I have yet to see on anything other than a Tiny Tad. Again some of these could be research colours or just small production runs. Part of the enjoyment of collecting any or all versions of Tadpollys is knowing that there could always be a different one just waiting around the next corner. I mean, how many people would think that there would ever be a Tadpolly in Red and White with a matching Santa hat and beard? Yep, really. It happened with the third and largest version, the Heddon Magnum Tadpolly, and the last one I saw, complete with hat, went for just shy of $200. Launched in 1970 and equipped with the by then almost obligatory brass hook hangers, the Mag Tad as it became known, Heddon series #9006, was 3-3/4” long and at 5/8 oz. and also the heaviest made. Rigged with correspondingly strong hooks, it was quite a beast. Colour wise, the Magnum Tadpolly had very few patterns in common with either the standard Tadpolly or the Tiny Tad. One or two like the Perch (L) are very similar but, for example, the Magnum Tadpolly version has a lot more Green on it and sports Black blush eyes. However, collectors are not short changed by the Magnum’s paint schemes because, like the Tiny Tad but even more so, there appears to be quite a few unique or experimental patterns around. For example there are Red, Green and Brown Crawdad patterns which share the same stripe pattern as the Mackerel (GDS) finish. Herring (HR) is only found on Magnum Tadpollys as is Black Scale with Red spots (BSR). I own two that are not stencilled with any name or model on the belly but, feeling the weight and the paint quality, and the fact that the paint masks are the same as other colour schemes, I believe are genuine Heddon finishes. I also have a marked Magnum Clattertad Tadpolly in a fluorescent Fuschia pink. Another chapter ends with the question, how many more? The final member of the ‘hourglass shape’ Tadpolly family, and also the smallest, is the not so common Mini Tad, Heddon series #590. Equipped with wire hook hangers, brass was probably just too heavy, this miniature Tadpolly, at only 1 3/4" long and 1/2" wide at it’s widest, is proportionately more like the 3” Tadpolly than the fatter Tiny Tad is. 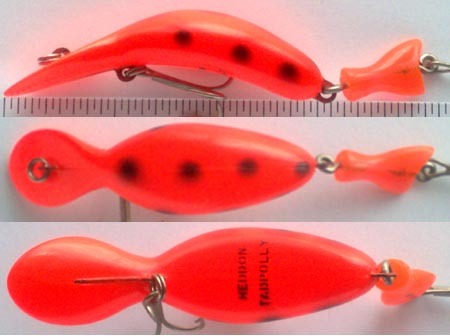 Released to the public in 1987 this tiny little Ultralight lure tips the scales at a mere 1/16oz.. Including Heddon’s 1990s three ‘G’ finishes, named after guanine, a substance that gives real fish scales their reflective quality, there are at least eleven shared colour patterns and four unique patterns found on the Mini Tad, although as always with Heddon, not all colours were catalogued. The commonest seen of these are the Green and Pink Shad (SD), and the Fluorescent Rainbow Trout (FRT). Making up the unique four are a Tan coloured Craw type pattern (CRD) and Frog (F) pattern, where the spots are more circular and less sharp than a Bullfrog finish. One can occasionally find the odd rogue Tiny Tad with Heddon Mini Tad stencilled underneath. In the past, long before I ever thought about putting pen to paper, or camera to eye, I sold both of my erroneously labelled Tinys. But if you ever see a Mini Tad in the flesh as it were, then there will be no mistake. Mention has to be made here of a small fly rod / ultralight size bait which, because of a very limited production run, just 1982 – 1983, is very rarely seen and will command asking prices often in excess of $50. 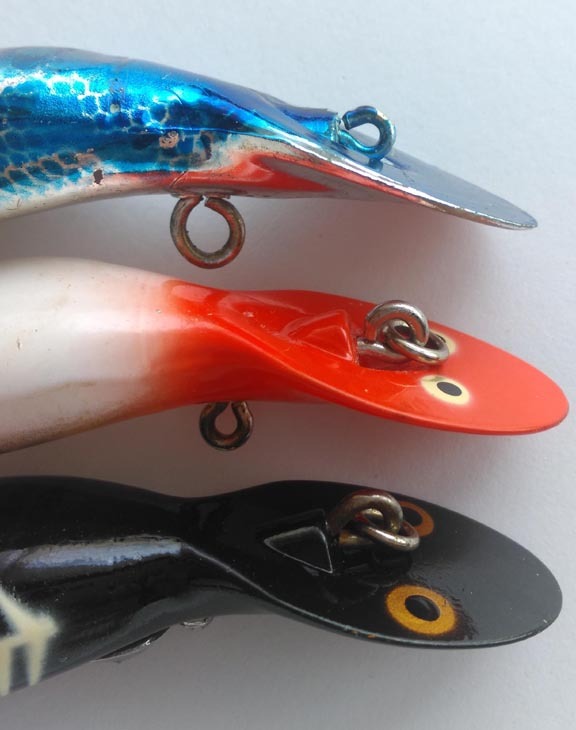 Only generally found in a few ‘standard’ colours, such as Spotted Orange and Black Shore Minnow, the Wee Tad, Heddon series #590, with only one treble hook attached, is more similar in shape to Heddon’s earlier wooden Widget lure, Heddon series #300, from the mid 1950s, albeit with a thicker neck and straighter body shape, than the classic elegant Tapolly curves. Like other Heddon lures, Wee Tads can occasionally show up in unique or uncatalogued colours. They also may or may not have a name stencil on the back of the 1 -1/4” body, as opposed to Heddon’s customary belly position. So, how much is your Tadpolly worth? Well, the short answer is “As much as somebody is willing to pay for it”. Lures in common colours with hook pointers, paint loss and other damage can be picked for well below $10. Lures in this condition should not really interest the serious collector unless the colour is a scarce or rare one, and will be upgraded at a later date when the opportunity arises. These would obviously command a higher price. Take for example a “rare as hens teeth”, Gold Eye Tadpolly with a couple of hook pointers and a tired lustreless White Shore Minnow finish, and I would expect it still to sell for only around $25 - $35. Value doesn’t necessarily depend on scarcity alone. Many collectors will pay more for a pristine or mint common colour / pattern if the lure is in it’s correct box, especially unopened, than a less common scheme in a lesser condition. Generally the later Ebsco / Pradco lures, which can still be found in their manufacturers packaging in abundance, can be picked up for under $12. Similarly earlier models, even some of the Gold Eye and Narrow Face Tadpollys, in good condition but a common colour, and not in their boxes, will fetch an only equivalent price. As in most areas of life, there will always be people, with more money than others, who are willing to pay over the top prices for something, just to own it. Whether it be a car, a piece of art or a bit of plastic and metal made to remotely, sometimes very remotely, resemble a small fish. If I was to find a late 1970’s or early 1980’s colour infused Tadpolly, in good to mint condition, I would hazard a guess that it would sell for between $20 - $35. The Pepsi Tad , which fits this category, and usually shows up on Ebay alone about 4 – 5 times a year, normally sells at double this, ie, around the $70 mark. However, one online auction that I watched, had two determined bidders, who between them pushed the final price to over $120. Somebody somewhere, not me unfortunately, I guess must have been a very happy seller that day. At the opposite end of the scale, I picked up my Bluegill Tad, covered in muck and who knows what else, and not exactly sure what it was I was looking at, for less than $6.00! After a good soak in warm water and a gentle cleansing with soap on a cut down toothrush, I now have a superb example of a colour I had not seen before, nor since. Lucky me. Where can that fit into any kind of rigid scale or grading. It can’t. How much would I have paid for it? I don’t know. Probably more than some, possibly less than others. I guess everybody has their own limits and reasons for them. Now, there has to be a Pike Scale out there somewhere surely? Supply and demand usually dictates that a lure colour with a lesser or shorter production run would command a higher price. As such I would estimate that a $25 - $40 price tag for some of the Magnum Tadpollys (except Santa of course) seems fair if in good condition and without their boxes. 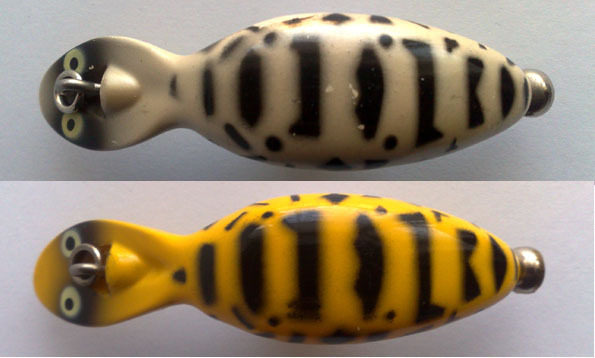 The same goes for the rarer 3” Tadpollys such as the Gold Eyed Yellow with Black spots or perhaps the Black over Yellow Crackleback finishes. Whether the Tiny Tad doesn’t generate as much interest amongst collectors or not I don’t know, but they certainly don’t command such high prices. Even new and boxed or carded they only seem to make it to around the high $20s mark. I should think most collectors of Tadpollys know that they will probably never reach the dizzying heights money wise of some of Heddons other plastic models, such as the Lucky 13. I have only ever seen three, including that jovial bearded fellow that comes on December 24, go over $100. As I said before, and I reiterate, I am no expert. I may know more than some but I’m certain others know more than me. Any errors are down to me and I will willingly stand to be corrected, and as for any omissions, well, just how long IS a piece of string? I only collect colours, not every colour in every model, but even so the numbers are ever increasing both in quantity and cost. Will I ever build that cabinet to show a complete collection? Build, yes, complete, probably not. Editor's note: If you have anything you feel would be of interest to the author, or have further information, you can contact him at Andy Girling! I was born 12 miles north east of London, England in the very early 1950s. By the time I was nine my dad gave up with me badgering him to take me fishing and bought himself a rod and reel and off we went to the nearby canal. I must point out that fishing here was and still is totally different to that on your side of the Atlantic. Dad caught, I watched. Within a few weeks I too had rod and reel. Sometime during the summer, fishing a local woodland lake, I caught my very first fish, a small Perch of around 4", and later the same day a small Roach of about the same size. I too got hooked that day. Strangely I had time to kill during a job I was doing last year and walked around that lake and leant once more against the very same oak tree, with it's twisted roots in the water, as I had over half a century ago. Suffice to say that both of us have increased in girth! Within two or three years I was reading everything I could about fishing, and then one day I saw a black and white photograph of an angler with a cantilever lure box open in front of him full of lures. I was intrigued because we didn't have them in this country in such variety. 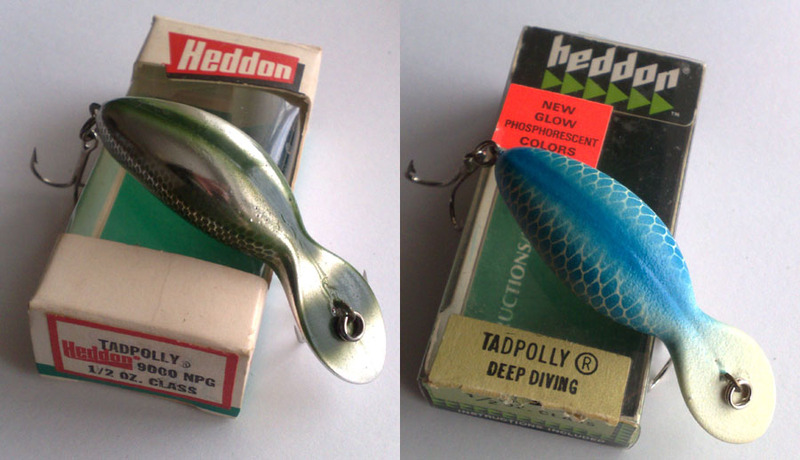 Time and life passed and then one day in the 1960s I saw in a tackle shop a Heddon Tadpolly XBW, in a blue stripe box. I had to have it, and so it began. I also bought a Tiny Tad in RH at the same time. Both I still have and the Gold Eyed XBW features in the photos later. The rest, as the saying goes is history. I am certain that when the time comes and I am no longer physically able to go fishing the lure collecting will continue. Always the hunt will go on for a Tadpolly in Pike Scale or yet one more unknown colour. The views on this page and related pages are those of the author and not necessarily those of this web site. Please contact the author at the above email address if you have comments, information, etc., relating to this article. This is one of a number of Lure Lore articles featuring collections of lure collectors. Contributions such as this are always welcome!